PT Krakatau Posco - PTKP or later known as Krakatau Posco is a rapid sustainable growth company in Indonesia, running business in iron and steel manufacturing industry. Located in Cilegon Banten, PT Krakatau Posco is a $2.66 billion multinational joint venture company between Pohang Iron and Steel Corporation (POSCO) and PT Krakatau Steel (Persero) Tbk, or Krakatau Steel Group (KRAS). POSCO is based in South Korea and is recognized as the sixth largest steel makers in the world. Krakatau Steel Group is a state-owned steel producers in Indonesia and is widely known as the first largest steel producers in South East Asia. 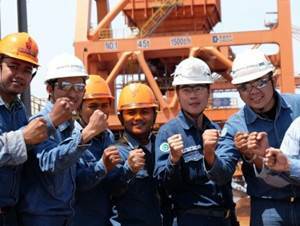 According to information found in Krakatau Posco's website as cited by JobsCDC.com, Krakatau Posco is 70% owned by POSCO, and 30% remaining shares by Krakatau Steel Group. Krakatau Posco was established in 2010 to answer the increasing of domestic steel demands, especially for construction, shipbuilding, manufacturing and slab for raw materials of HSM KRAS. Krakatau Posco's steel mills was inaugurated in 25 December 2013. In the first phase of the project, Krakatau Posco's steel mills will produce 3 million tons of steel slab and plate per year. At second phase of the project will reach 6 million tons annually. University graduates with minimum GPA of 3.00. Fluent in Korean, both oral and written. Willing to be stationed in Cilegon Banten. Bachelor of Law with minimum GPA of 3.00. Advanced knowledge in Corporate and Business Law, including litigation/alternative dispute settlement proceedings. JobsCDC.com now available on android device. Download now on Google Play here. Please be aware of recruitment fraud. The entire stage of this selection process is free of charge. PT Krakatau Posco - Production Supporting Staff, Legal Staff Krakatau Posco July 2018 will never ask for fees or upfront payments for any purposes during the recruitment process such as transportation and accommodation.